I try to take advantage of promotional credit card offers as much as possible. When big bonuses come around, I apply. When great cash back reward programs are offered, I’m immediately figuring out how much money I can save by using a new card instead of an old one. But sometimes all these new credit cards and their spending requirements can get me into a bit of a bind. One of those binds happened last month. In February, I signed up for a Chase Sapphire Reserve credit card. It offered 100,000 bonus points if I spent $4,000 in the first 4 months of account ownership. Well, my spending on that card was awfully light for the first few months. I’m not a heavy traveler, anyway. And I was grounded for a few months after the birth of my second child. However, an opportunity arose to spend on the card with the purchase of a new vehicle. The dealership where I purchased a used 2015 Toyota Highlander let me put a down payment on my credit card. I jumped at the chance, put down a $15,000 deposit, and BAM! I had met my spend hurdle while earning another 15,000 Chase Ultimate Rewards points. The plan was to simply take the funds I had set aside for the deposit and pay off the credit card. But then an investment opportunity came around just a few days later, and I jumped at the chance. I now had a $15,000 debt on my credit card and no immediate funds to pay the balance down to zero. Ugh, why do I do these things?! This didn’t phase me, though. I knew my credit score was in the low 700s, so I planned to simply open a new credit card and transfer the balance at 0%. And I did just that. I chose the Barclaycard Ring MasterCard because there was also no balance transfer fee. Over 15 months, I could pay the debt down to zero, without worrying about a penny of interest. There was a big surprise, however, after completing my application. I received the dreaded letter in the mail letting me know I was declined. So, now I have two choices. I can decide to apply for a different card (which would again slightly lower my credit score). Or, I can sit back and be stuck with credit card interest I don’t want. Credit card issuers use a fair amount of logic when deciding whether or not they want you as a client. And if you apply and are declined for a credit card, there’s generally a very good reason (although I’ll argue against that for the reason I was declined shortly). Let’s take a look at the five most common reasons why you would be declined. Then we’ll talk about how you could improve in those areas. The greatest fear for a credit card issuer is having to write off your debt. When you consider how an issuer makes money, their biggest risk is lending credit that is never paid back. Accounts in charge-off status or collections can drop a credit score like an anchor. And having more than one negative account on your credit score nixes your chances of acquiring a credit line with a respectable interest rate. Negative credit accounts can stay on your credit history for seven years, so they can do lasting damage. Before succumbing to the idea of a collecting agency calling you at all hours of the night, work with your lender as much as you can to avoid that outcome. Many will make a payment schedule because they too do not want to sell your debt for pennies on the dollar. Take advantage, and do your best to never let an account fall into the negative category. This was the only reason listed for why I was declined for the new balance transfer credit card (letter image below). 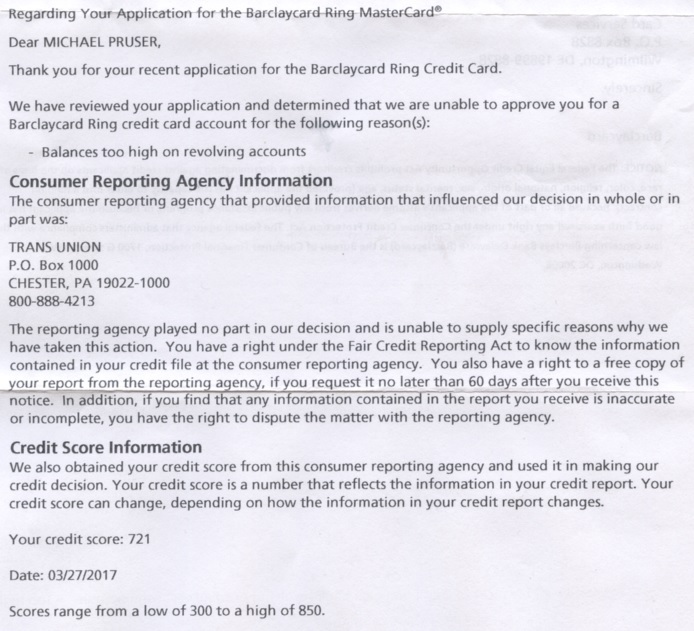 With a credit score of 721, I was told I could not receive my Barclaycard Ring Card because the balances on my revolving accounts were too high. Full disclosure: I currently have eight credit card accounts and carry balances on two of them. One of those balances is the $15,000 on the Chase Sapphire Reserve, and the other is our normal $3,000 – $4,000 balance on our everyday spending card. We use that credit card to buy everything: gas, groceries, utilities, health insurance, etc. So, at a certain point every month, most of our monthly charges are on one card, which we then pay off. I assume that at the time of my application, we had two cards with a balance. My debt-to-credit ratio was still well below 30%, and there were no other reasons listed on my denial letter. So, I’m still shocked that a 721 credit score would be declined for a balance transfer credit card. After all, it’s a balance transfer credit card. I wouldn’t be applying unless I had a balance to transfer! What a novel idea. 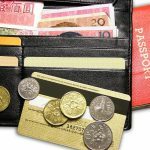 Nevertheless, credit card issuers appreciate a low debt level for every individual account, and carrying even a few balances can be problematic. If you get denied for this reason, pay down some account balances before you apply again. Related: What Is Your Debt-to-Income Ratio and Why Should You Care? In order to be approved for a line of credit, you must show the ability to pay it back. So all credit card applications include a section on your job and income level. If your credit score is not excellent, an income of $20,000 or less annually is a red flag. One way to boost your income level in the eyes of a credit card issuer is by including the income earned annually from your spouse as well. Most credit card applications are unspecific when asking for this information, and if your application goes into the secondary pending stage, you’ll likely be given a chance to provide proof of income for both you and your spouse. Featuring a high income level lets an issuer know you have a steady employment and the ability to pay back the money you spend on your credit card over time. Inquiries are one of the more unique aspects to your credit profile, because it doesn’t matter whether you’ve opened a new credit line or not. The mere attempt to do so is an alert to credit issuers that you are in the market for credit. The lower the number of inquires you have, the higher your credit score. And the more confident a lender is in approving your application because it signals that you don’t need credit at every turn. On the contrary, when you’ve opened up a lot of inquires, it signals you need money. While the occasional inquiry has it’s merits, a barrage of them in a short period makes issuers reconsider. Your credit history stores inquiries for two years, and not all inquiries are equal. For example, a consumer with a mortgage loan inquiry, car loan inquiry, and credit card inquiry would likely have a stronger credit profile and higher credit score (as related directly to inquires) than someone with three credit card inquiries. Pay careful attention to this part of your credit profile before applying for your next line of credit. The application itself is enough to lower your credit score for two long years. When issuers evaluate your credit profile, they look for a healthy credit history. This means keeping balances low so issuers are more comfortable lending you money. When an issuer sees you have plenty of credit available and are instead choosing to open a new credit card with them, they’re eager to approve you and compete for your business. If the issuer notices a high debt ratio and maxed out accounts, they aren’t likely to extend you more credit. Credit card issuers rarely give credit when you most need it, so take advantage of good credit lines when you have a great credit score. Especially as interest rates continue to rise, locking in a fee-free line of credit with excellent terms now can serve you well in the case of emergency. Should life take a turn for the worst, you don’t want to look back and wonder what you could have done with a 775 credit score while trying to figure out what you need to do now with a 600 credit score.